(Almost) Anyone Could Print Money? Did you know that at one time banks in America could print their own money? 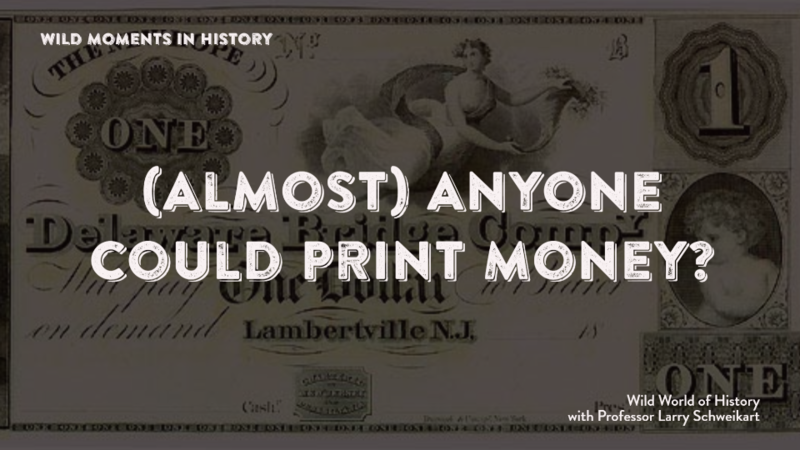 Prior to 1863 any chartered bank could—and did—print its own money, in any denomination. Yes, there was a real $3 bill! Often, the money was designed with the owner’s picture, or that of his wife, right there for all to admire. The practice involved the issuance of a charter, or a right to do business, from the state legislature. A would-be banker had to show that his institution would be a public benefit and would exist to do more than make money (harkening back to the old mercantilist days of business). Each charter required that the bank “convert”its banknotes into gold or silver, known as specie, upon demand. Failure to do wo would cost the bank its charter. Bankers soon realized that if they “emitted” $1,000.00 in notes, that fewer than $200 of those notes would ever be presented for redemption at any given time. Thus was born “fractional reserve banking,” whereupon a banker kept a fraction of the total amount needed in a specie reserve—and loaned out the rest. Soon it was well-known that only the weakest or least trustworthy banks needed to keep much more than 6-7% of their total outstanding notes in actual specie in their vaults. That is, fewer than six out of one hundred people who had taken the bank’s notes to conduct business would show up on a given day and demand gold or silver. And those would usually be people going out of town. Ironically, the higher your reserves, the weaker your bank. A bank that had to keep 20% specie reserves didn’t have much trust, but a bank that only had 5% reserves showed that people by and large trusted it to pay out specie on demand. Still, the problem was that there were banks, each with their own notes, all over the country. How did you know whether a banknote was good or not? Bankers had a publication called Dilliston’s Bank Note Reporter which was as up-to-date as the times allowed. It reported on all known banknotes in the country and what “discount” they were trading at. Normally, a note would trade at a half-a-percent discount, as it always cost some money to collect the notes of a bank in another state, bundle them up, and ship them back to payment in your own notes or in specie. If you looked at Dillilston’s and it had a note trading at a 30% discount, that was bad news. Merchants likely would not take that money. The U.S. government taxed all these private banknotes out of existence in 1863-64 with the National Bank and Currency Acts in order to make way for the new National Bank Notes, which were emitted by the new national banks (it’s in the name), and which alone had authority to print money after 1863. For more, see a book I edited called The Encyclopedia of American Business History and Biography: Banking and Finance (both volumes) or my overview of the history of business in The Entrepreneurial Adventure.